Melissa was born in Massachusetts, but has lived in Florida since 1974. She resides in Ft. Pierce with her husband, two children, and a few dogs! She enjoys her family’s very busy baseball and softball life. She loves the salt life Florida has to offer, so a day at the beach with her feet in the sand is priceless! Melissa earned her dental assisting certification at IRSC in 2003. 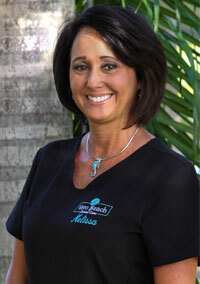 She takes great pride in assisting Dr. Clay and caring for our patients at Vero Beach Dental Care!